For myself, I have never encountered a writer who has convinced me more plainly—or more poignantly—just what the love of God looks like. From his fairy tales, to his novels, to his sermons and essays, MacDonald never veers from his central truth: that God loves the people He has made, and will do whatever it takes to be reunited with them. The Gospel flashes on every page, yet his stories are never preachy. They are hard at times, requiring painful obedience on the part of his characters, but it’s an obedience born out of love, not legalism. At face value, George MacDonald’s stories are rip-roaring yarns, most of which are set in Scotland, with a dash of Highland wildness for good measure and more than a generous helping of brogue. But it doesn’t take more than a casual acquaintance with MacDonald to realize that there’s much more going on here than meets the eye. Like the fire of roses in The Princess and the Goblin, there is an irresistible fragrance and warmth at the heart of his tales, drawing us into the essential comfort of the good news they bear. From the wells of a limitless imagination, Macdonald draws us unforgettable pictures of an active salvation; his words are a bracing draft of Kingdom wine to cheer the heart, and a stiff breeze of Kingdom freshness to clear the mind and open the eyes. And I’ve found that the longer I sit with his stories, the more they mean—and the more I see. I read Phantastes (the book that Lewis credited with the “baptism of [his] imagination”) upwards of ten years ago, but the images contained therein are of such a continually recurring vitality, it seems like I read it only yesterday. It would be unfortunate, however, to read only his stories and miss his sermons and essays. While MacDonald’s fiction is thick with imagery and quotable lines, there’s a straightforwardness about his non-fiction that collars the heart with its insistence on the greatness of grace, and the unnecessary hardship of resisting it. But, oh, how I love his stories! Being of an imaginative turn of mind, that is where he meets me best, among his gallant Highlanders and goblin-defying princesses and haunted castles and agelessly immortal great-great grandmothers. And while I appreciate the fact that recently edited versions of MacDonald’s fiction have brought dear Grandpa George out of total obscurity in this day and age, I really think it’s a shame to miss his tales in their original language. To be sure, the brogue can be a bit of a challenge at first, like reading Shakespeare for the first time, but once you get its cadences in your head, it fills your mind with music. And in a brisk world of complicated ‘conveniences’ and short attention spans, I’m convinced that a little mental workout is as good for the soul as it is for the head. George MacDonald is a treasure for the seeking heart. And it is for this reason that I am absolutely thrilled to be able to offer today some exquisite, heirloom-quality editions of MacDonald’s works. These books are produced by a small family press, using printing plates made from antiquarian originals, some of which are first editions. The books are printed on a Heidelberg press, using archival paper and soya-based ink—and, what’s more, these books are bound by hand. Being a bookbinder myself, I simply cannot get over the quality and craftsmanship of these volumes. They are simply beautiful. 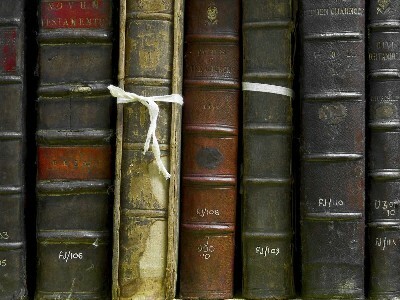 Not only that, they are durable, having been coated with the same waterproofing material that was used in 19th century bookbinding technique. These books are as close as you can get to what a brand-new edition of an original George MacDonald book would have looked like. There are selections of sermons and literary criticism, in addition to several of his novels, among them my personal favorite (of the non-fantasy fiction variety), What’s Mine’s Mine. There’s also a copy of the beloved Sir Gibbie (“It moved me the way books did when, as a child, the great gates of literature began to open and first encounters with noble thoughts and utterances were unspeakably thrilling,” wrote MacDonald’s editor Elizabeth Yates) and it’s deliciously inscrutable sequel, Donal Grant… among others! 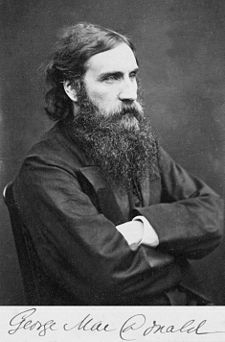 To see all of the George Macdonald in inventory, you can click here. And as an added little bonus, I’m listing a pretty reading copy of MacDonald’s beloved fairy tale, At the Back of the North Wind. It’s a much-loved volume, in a rather Skin Horse kind of way, but the binding is sound, and the illustrations are enchanting. If you’re interested in reading a bit more about George MacDonald, you can read my review of Lilith here. Ron Block wrote a wonderful review of Donal Grant for The Rabbit Room. And here’s a long passage I love from Phantastes that gives a glimpse of the greatness of this great man’s heart, and the tenderness of his imagination. I knew you’d be a MacDonald fan! Oh Lanier! The best gift I ever received was one my father gave to me in college: the complete works of George MacDonald published by Johannesen. I can’t tell you how much they mean to me, but I can tell I don’t have to explain that to you. My favorite novel is also What’s Mine’s Mine. Oh my heart! PS- Have you read George MacDonald and His Wife? Love! 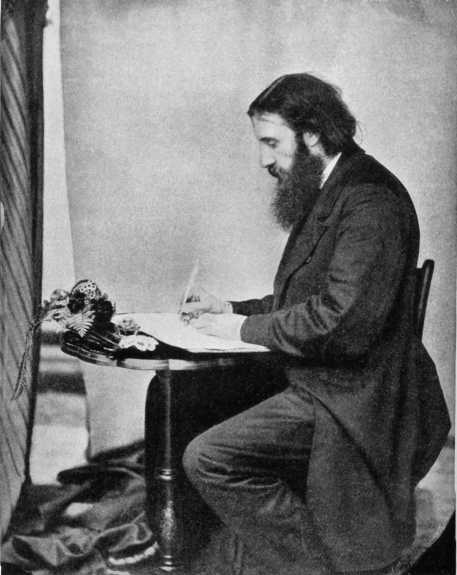 I don’t think I’ve ever seen a photo of George MacDonald before. He doesn’t look like an author to me! He looks like, oh, a coal miner or something, but with dreamy eyes and fiery stance! I’ve not done more than skim his serious works, but images from his fairy tales stay with me forever: Diamond’s hay loft and, my very favorite: Grandmother’s pigeon eggs. Somehow I have that image mixed in my mind with Tasha Tudor’s fantail doves, and I’ve dreamed of building a dovecote in one of my windows and living on doves’ eggs. CSL’s beloved Phantastes left me mostly unmoved, except that I gained this tremendous piece of wisdom from it, that there is an ideal distance/nearness for each person in your life and you should leave them there and love them there! In the past, I would try to draw people nearer to me if I liked them well, and didn’t understand why it didn’t work. He taught me to think, “I don’t think I could love this person at closer range, but that is not asked of me. I love them very much right at the distance they are at!” (This has helped especially with some family members and artists/musicians.) I wonder, as I write this, if this even applies to God. I just finished the first volume of CSL’s Complete Letters. Toward the end, he and Arthur Greeves discuss Sir Gibbie and What’s Mine’s Mine. (I *love* reading CSL’s reactions to books!) So I’ll probably read those next. What is drawing me mostly this year, though, is The Diary of an Old Soul. What an intriguing title! I’m not sure that I don’t need, more, the Diary of a Youthful Soul…oh, wait…maybe that’s your website (smile) or the Anne series. I don’t find in his works, yet, the core “goodness” that CSL describes…I don’t see the magnitude, at least, of what he sees, but, as with most things CSL has read, I move quietly and (hopefully) humbly through at my own level. And…I think it would help to read them in England. Since my entire hope of spending eternity with Jesus is based upon this very substitution as described by Isaiah and elsewhere (“but he was wounded for our transgressions, he was bruised for our iniquities: the chastisement of our peace was upon him; and with his stripes we are healed.”) I’ve decided not to read any more of his works, nor to seem to be recommending him to others. This is my “Retractations;” even St. Augustin wrote one. 🙂 And I wish to write it in case anyone else suspects they are seeing darkness instead of light, when so many Christians, including CSL, recommend this author. Have you read Parish Papers? It’s a trilogy starting with A Quiet Neighborhood, so incredibly lovely. Fantasy is usually my genre of choice, but MacDonald can make even the most realistic story fantastical. I feel…ashamed almost…that I do not know George MacDonald better. I love Diary of an Old Soul, and I’ve read the Princess books multiple times each and some of his other fairy stories. But he was so prolific, and I’ve barely scratched the surface. Thank you for this “proper introduction,” which has whet my appetite for delving into more of his work. My heart actually hurts reading your love for him and the other comments, too. So beautiful.